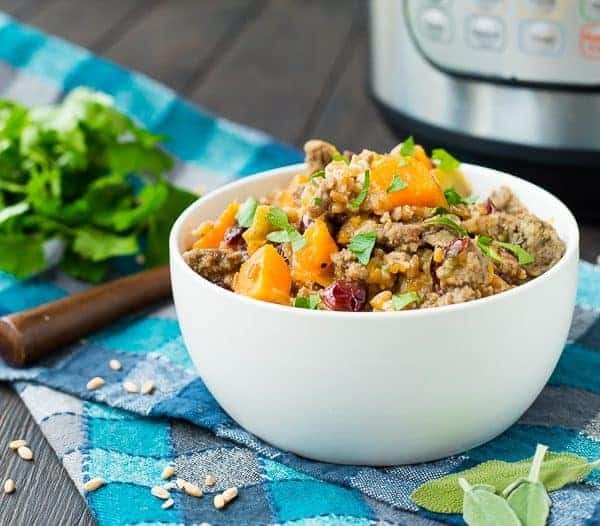 Great any day as a complete meal, or as a Thanksgiving side, this Instant Pot Farro Stuffing with Sausage and Sweet Potatoes is flavorful, warm and filling. If I’m not cooking chicken or eggs in my Instant Pot, I always feel like it’s a bit of a gamble. Sometimes I have to do a little research on how to cook that specific item in the pressure cooker first, sometimes I just wing it. With this Instant Pot farro, the first time I made it, I was rolling the dice. Is it going to turn out? Will it turn into an unidentifiable mush? Will the farro cook all the way? Well, I come to you with good news. It was a success! The farro was perfectly chewy, just like it should be, the sweet potatoes stayed intact, and the level of liquid wasn’t obscene, it was perfect! I was happy as a clam. As a bonus, it didn’t explode in my kitchen and I didn’t burn myself when I let out the pressure. That’s always a good thing, right? The apples tend to disintegrate a bit, but I love the subtle tart sweetness and flavor they add throughout the farro stuffing because of this. It does leave the peels behind — again, I don’t mind this because I love eating the apple peels but if you’d prefer that not to happen, peel your apple before chopping it. 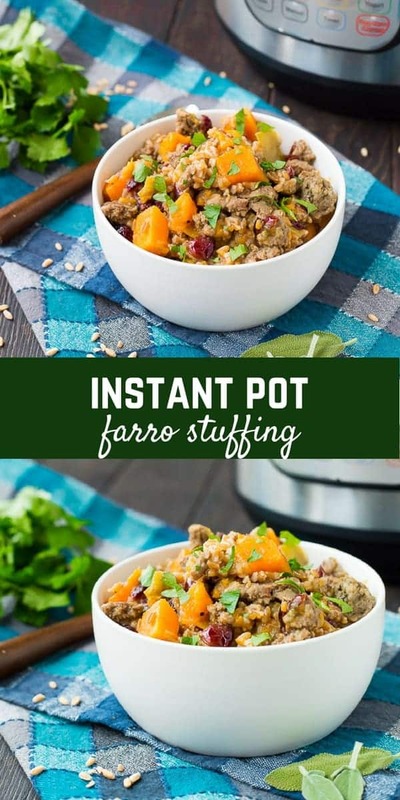 Tip: Since this farro stuffing also includes sweet potatoes and cranberries which both add a sweet component, I recommend using a more tart apple such as a Granny Smith. The great part about using the Instant Pot to make this farro recipe is that you’re only making one pan dirty. You brown your sausage using the “Saute” setting on the pressure cooker and then you literally just add everything else and stir it, cover it, and cook. I told Ben I made this and he was super skeptical. I showed him the photos and he still wasn’t convinced. I told him it had a lot of meat in it and he still wasn’t jumping for joy. He’s not a fan of sweet potatoes (exception: vanilla bean mashed sweet potatoes), and sometimes he’s not into grains beyond rice. Luckily for him, I make it all anyways and then we discover he loves things like vanilla bean sweet potatoes and Instant Pot farro stuffing. I bet he’s glad his wife is so stubborn, don’t you think? Let’s back up just a touch and talk about the farro. If you’ve been around here for any amount of time, you’re likely familiar with farro thanks to recipes such as Farro Salad with Butternut Squash, Bacon, and Kale, Zucchini Noodle Mason Jar Salad with Farro and Mozzarella and Farro Salad with Za’atar, Broccoli and Feta. Farro is a type of wheat – so nope, farro is not gluten-free. Farro is hearty and chewy and maintains it shape (unless you cook it to death) – making it great for salads! Farro has a rich, nutty flavor. It’s one of my favorite grains and if you haven’t tried it, I hope you give it a try and love it as much as I do. 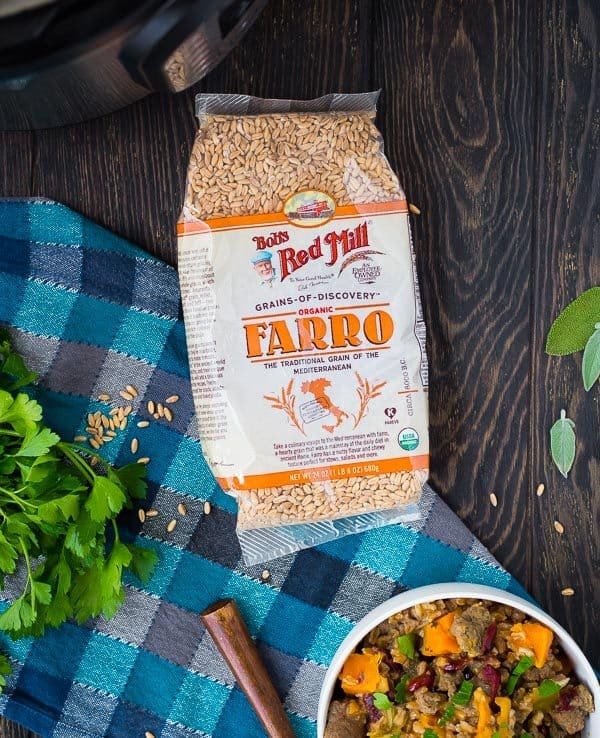 I’ve partnered with Bob’s Red Mill for this post, but that is the brand of farro I buy regardless. Whether you use this as a replacement for traditional stuffing or if it’s a weeknight meal, I really hope you guys love it as much as we do! 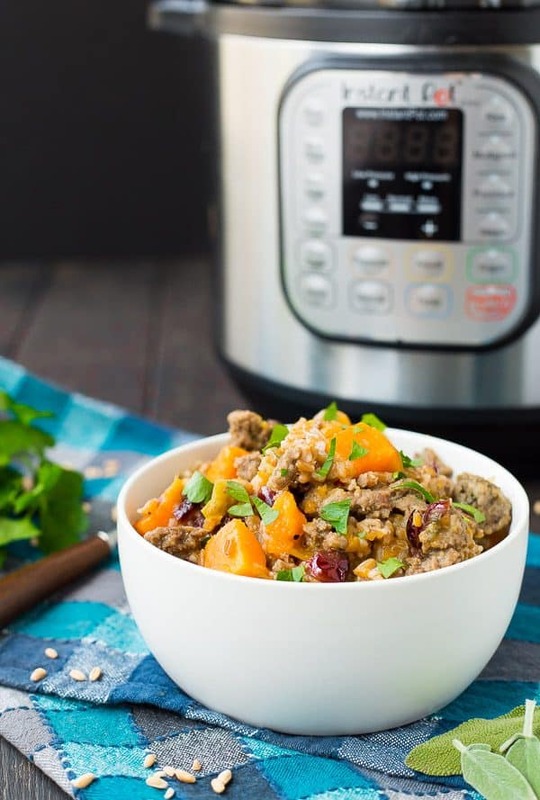 Heat Instant Pot to Saute and add oil. When oil is shimmering, add sausage and onion and cook, breaking up sausage as it browns. 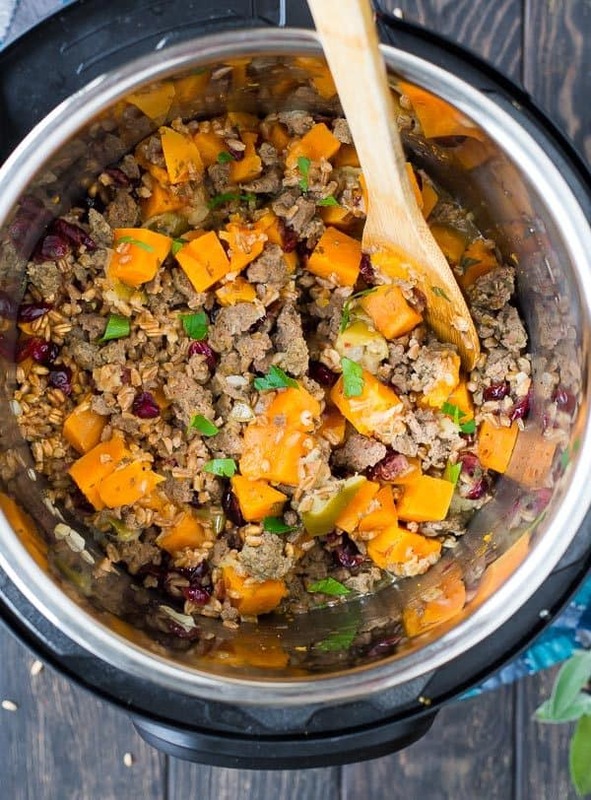 Add farro, sweet potato, apple, cranberries, sage, parsley, bay leaf, salt and pepper. Pour water in and stir to combine all ingredients. 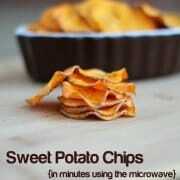 Place cover on Instant Pot and turn valve to seal. 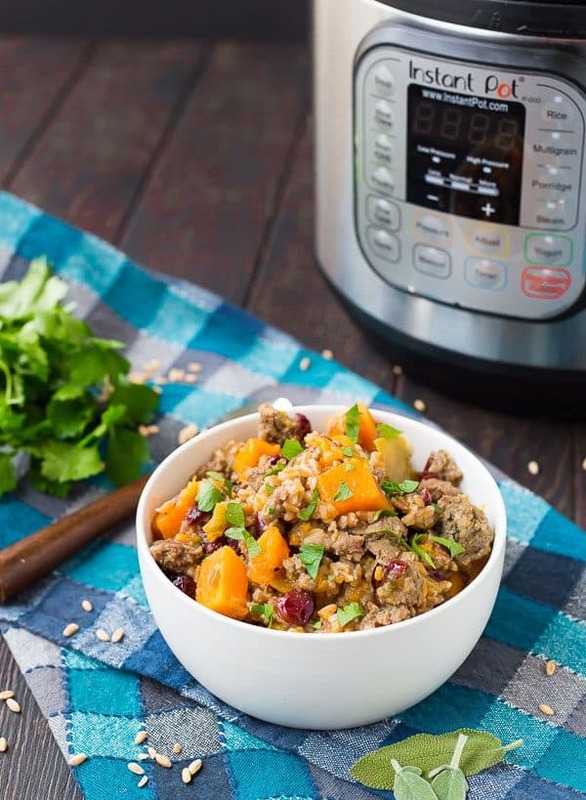 Use the manual setting and set Instant Pot to high for 10 minutes. When it is done cooking, let it naturally release (aka leave it alone) for 10 minutes. When 10 minutes has elapsed, quick release the pressure. 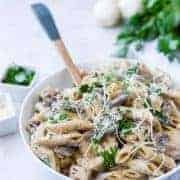 Stir gently and serve immediately garnished with fresh parsley. Note: For added crunch and flavor, try adding a sprinkle of toasted pecans or walnuts after it has cooked! Note: Pick a tart apple such as a Granny Smith. Peel if desired. 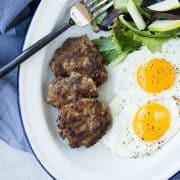 Note: If you don’t use a lean sausage, you may want to drain grease before adding the rest of the ingredients to the Instant Pot. Do so very carefully! Verdict: I love this – it’s cozy and comforting and so flavorful. Husband’s take: He loves this way more than he thought he would initially! Changes I would make: None are necessary, but if it wasn’t for my nut-allergic kids, I’d sprinkle a few pecans or walnuts on top! 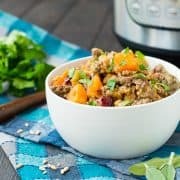 Disclosure: I’ve partnered with Bob’s Red Mill as a brand ambassador to bring you this post and this Instant Pot farro stuffing. They compensated me for my time but all opinions are, as always, my own. If you opened my cupboards and fridge, you’d find a wealth of Bob’s Red Mill products that I have purchased myself. Thanks for supporting Rachel Cooks by reading about brands I use and love!